Advocates for additive manufacturing (AM) view the technology as a strong potential contributor to companies’ quest for excellence. In the right context, they see the potential to meet or exceed the direct-cost standards established by more traditional manufacturing methods while simultaneously offering the opportunity to achieve superior supply-chain and product performance. At its simplest, additive manufacturing is the process of building up a three-dimensional object layer by layer from a digital file, adding material only where it is needed. This contrasts with traditional manufacturing methods (subtractive manufacturing) that starts with a raw material that is then reduced to its desired size and shape. The full applications of this technology are being seen as it moves from prototypes to full-scale industrial production, in areas ranging from food, to aerospace and healthcare. Fig. 1: 3D printing is a form of additive manufacturing and can be used to print anything from toys to electronic components – and even food. Additive manufacturing has developed from a number of technologies that emerged over the past 20 years, including software, automation, materials science and post-processing. The technology is now available through off-the-shelf printers and is increasingly being integrated with conventional production technologies for industrial applications. Additive manufacturing can reduce waste, challenge global supply chains (through localised manufacturing) and offers flexibility in the manufacturing process. 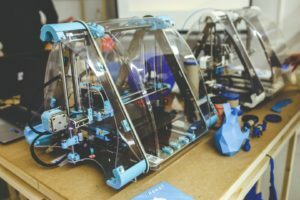 Although the equipment required can still be quite expensive, new business models, such as Fab Labs, are increasing its accessibility. With the business case for using additive manufacturing in small scale and customised production already clear, we can expect to see rapid expansion of the technology’s applications. The FabLab concept was first introduced to South Africa in 2005 by the Department of Science snd Technology (DST) under the auspices of the Advanced Manufacturing Technology Strategy Implementation Unit (AMTS-IU) and managed by the Council for Scientific and Industrial Research (CSIR). It is a concept that originated as the educational outreach component of Massachusetts Institute of Technology’s (MIT). A FabLab consists of a suite of off-the-shelf, industrial grade, digital fabrication tools, an electronics workbench, seven computers, programming tools, and is supported by open source design software. The FabLabs are a small-scale version of a production factory. While the FabLab cannot be used to manufacture thousands of assembly-line products, it can be used by individuals to create prototypes from arts and crafts to engineering and architecture models. The idea of using printing technology to manufacture electronics dates back to the early 20th century, but its use for volume manufacturing didn’t become prevalent until the 1950s. Back then, photo plotters were used to produce master artwork circuit patterns on a clear mylar or glass substrate. The master artwork circuit pattern was then transferred onto a copper clad laminate coated with positive photoresist material. The printed circuit board was born. Development continued and resulted in sophisticated manufacturing techniques. In the late 1990s, the US Defence Advanced Research Programme Agency (DARPA) initiated a project to develop a new tool specifically designed for the printing of electronics. The goal of the project, named Mesoscale Integrated Conformal Electronics (MICE), was to develop a single tool capable of rapid production of electronics directly from computer aided design (CAD) models. The objective was for this tool to support processing of a wide variety of materials to produce robust, customised electronic components in a conformal manner on virtually any substrate, including low-temperature (<200˚C). The new tool developed under this DARPA programme was aerosol jet. Electronic components such as resistors, capacitors, antennas, sensors, and thin film transistors have all been printed with aerosol jet technology. The performance parameters of printed components, for example the ohm value of a resistor, can be controlled through printing parameters. Components can also be printed onto three-dimensional surfaces eliminating the need for a separate substrate, thereby reducing the size, thickness and weight of the end product. For example, aerosol jet is used to print antennas and sensors that conform to the shape of the underlying substrate such as a cellphone case. Fig. 2: Components can be printed onto three-dimensional surfaces, eliminating the need for a separate substrate, thereby reducing the size, thickness and weight of the end product. The technology behind aerosol jet enables printing of interconnects on both 2D and 3D substrates. For 2D applications, multi-level interconnects can be created by printing a dielectric material at circuit cross over points – in essence emulating a multi-layer circuit board but on a single layer. This can be accomplished because the aerosol jet process supports multiple ink input devices allowing materials to be switched or even blended during printing. Also, aerosol jet can print conformal interconnects on 3D surfaces eliminating the need for wire bonding – for example printing electrical connections on 3D stacked die or for LED chip fabrication. The aerosol jet process supports printing on a wide variety of substrates including plastics, ceramics and metallic structures. Commercially available materials, such as nano-particle inks, have been optimised for the aerosol jet process to allow printing (and subsequent ink sintering) onto plastic substrates with low heat deflection temperatures. There are still barriers such as slow print times, the quality of surface finish and high raw material costs (materials are often specific to brands of printers) will impede adoption in mass production environments. Well at least for now! Additive manufacturing has made a major impacts in the medical field where a prosthesis can be manufactured to meet the requirements for an individual implant of a hip and knee joint. There is now talk about printing components for a new heart from inert materials that would not be subject to rejection. In the automotive industry, Toyota uses additive manufacturing technology to “print” a sample of a new model to be introduced to iron out any problems before the real manufacturing process. In certain areas, such as food, the choice and accessibility of materials makes the use of additive technology more attractive. But will it replace a juicy steak on the braai? I hope not!